Being Influential is the natural quality that is built when the person is going to make progress in a particular field. We are happy to tell you about the most powerful influencers that have full awareness of social causes and are continuously leading the number of campaigns successfully. If we talk about the highly ranked officials at UAE, the name of Mohammed Al Shaibani is at the top. He is the CEO of the Investment Corporation of Dubai. He has also attained many high positions at UAE which are the reason for his most influential person at UAE. He is also the chairman of an Islamic bank and many more. No one can deny his value in the field of business. Mubadala Development Company is the largest company that has the largest investment funds. He is working as a CEO in that company. In 2011, their investment funds will be $48 billion. So, you can easily estimate how successful this company is. Khaldoun Al Mubarak due to his place in this big company is the most influential person of UAE whose worth can’t be denied. He has struggled much for establishing the business and also in several sports. These struggles are the reason for his being influential in the entire world. No one is unfamiliar with the name of Emaar Properties. He is chairman of Emaar properties at UAE. He made the tallest building called “Burj Khalifa”. His achievement is apricated and is the reason for his fame. The making of such a huge building broke the record and finally his name was also added in the list of UAE’s 6 most influential people. The Dubai mall was also his plan which has now billion of visitors for shopping annually. She is at the top list of the UAE’s most influential people because she has got enough fame in the field of business. Currently, she is struggling much as a Federal Government’s Minister and trying to make her value in international corporation and development. Emirates Nuclear Energy Corporation also regards her efforts for the betterment of Emirates and they consider her as their most effective participant. He is the chief executive at Abu Dhabi and due to his great struggle for UAE also falls in the category of UAE’s 6 most influential people. He is working as a CEO in the most famous oil company of UAE. He didn’t only rely on the money of his family. Although he was strong financially in his life, he invested in many oil companies. Now he has gained enough success and has his own automobile companies at UAE named as Omair travel and Omair automobiles. She has hosted almost 25 million visitors and this is the prominent reason why she is in the UAE’s 6 most influential people. She is trying her best to make UAE the most powerful place in the near future. She is struggling much and looking beyond 2020. She is the minister of UAE. She is not only trying to make the fame of UAE but is also working to manage many international affairs. 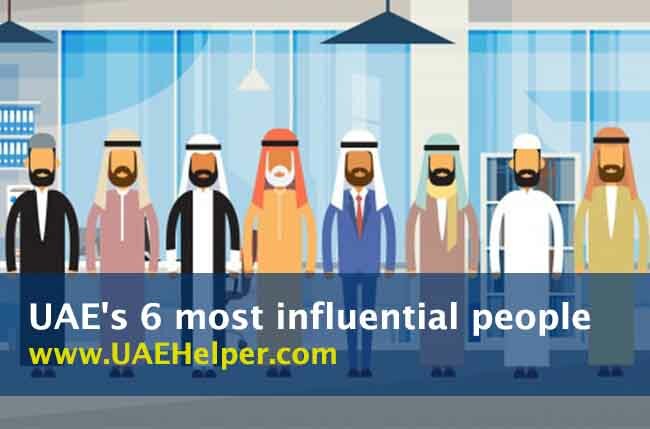 These all are the most influential people in the UAE. We believe that some of you are only aware of their name but don’t know what they have actually done. We have tried our best to inform you why they are at the top list of the best influencers.